After decades of successfully avoiding responsibility for the consequences of its glyphosate herbicide, Monsanto has been ordered to pay US$39 million to cancer sufferer Dewayne Johnson by a San Francisco court, writes Alan Broughton. Monsanto was also fined $250 million. This is the first of about 8000 such cases pending in the United States. Shareholders in Bayer, the huge German chemical company that purchased Monsanto in June for $60 billion, lost 10 billion euros as a consequence. Today, Tarshiha is promoted on AirBnB as Ma’alot-Tarshiha in the Galilee region of Israel and, depending on your budget, you can book somewhere chic and stylish to take in the stunning views or a more humble, village style experience. Seventy years ago though, Tarshiha was a village in Palestine. Chanting “Fund the gap or we’ll be back,” more than 200 health workers protested outside Victorian health minister Martin Foley’s office on August 16 to demand the Labor state government restore funding to community mental health services. Services have been severely affected by the state government’s decision to cut $75 million from mental health funding. From your morning coffee to your afternoon alcoholic drink with friends, drugs play a significant role in society. However, the war against drugs that has plagued society has resulted in a differentiation between the legal drugs we consume and the drugs that are criminalised by the government. According to 2016 government data, 8.5 million people — 43% of Australians — have used recreational drugs and illegally obtained pharmaceuticals for recreational or self-medication uses. The premise seems simple and hard to argue with: establish an online database for medical records, controlled by the patients themselves, to improve access to crucial information for healthcare providers. 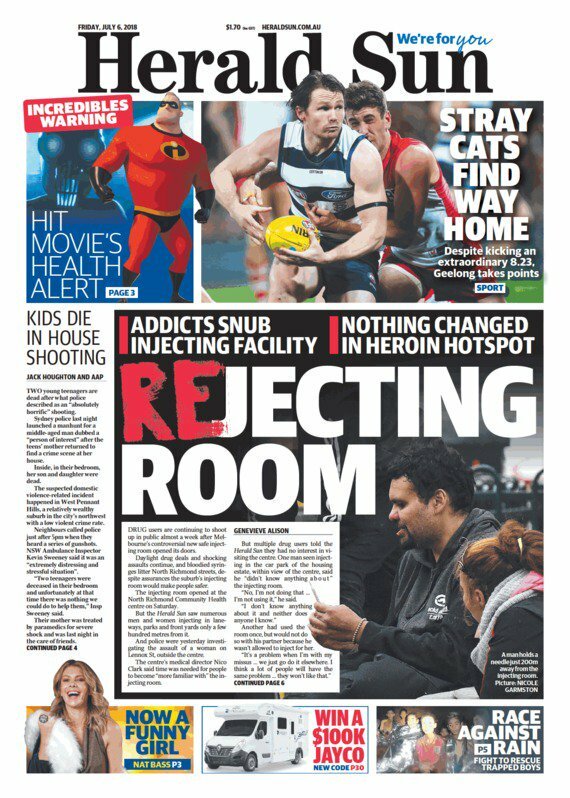 “REJECTING ROOM”, screamed the front page of the Herald Sun on July 6, in a very clever pun on North Richmond’s safe injecting room that had opened a few days earlier. “Addicts snub injecting facility” and “Nothing changed in heroin hotspot” sat above the main cover slogan to emphasise the point about ungrateful “druggies”. The recent pill testing trial at the Groovin’ the Moo music festival, demonstrated why pill testing is an effective harm minimisation activity but also why we need to end drug prohibition in Australia and to effectively regulate the quality and supply of drugs here.